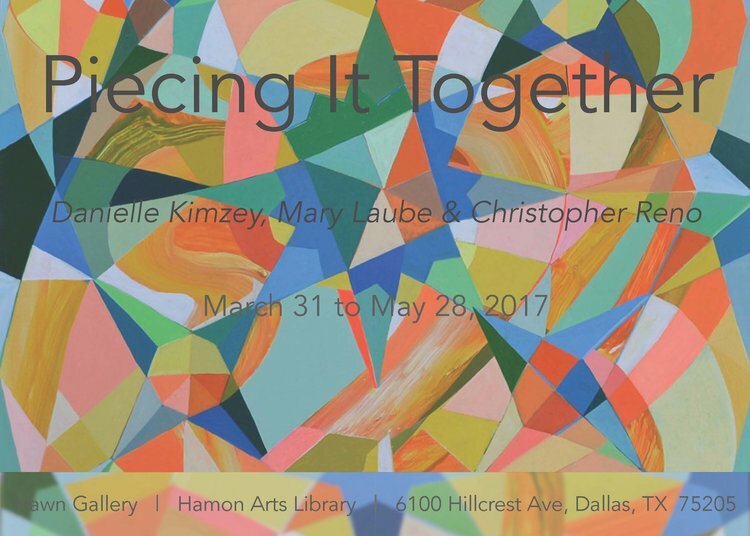 DALLAS – Galleri Urbane is pleased to present our first solo show by Dallas-based artist Danielle Kimzey. Titled Viewfinder, the exhibition will feature a body of all new paintings that offer a fragmented glance into the everyday world of the artist. In this series of work, Kimzey finds an interest in her experience of time, though not in a grand, scientific manner, but rather in the quiet, often-overlooked moments that mark her daily existence. Dwelling on these episodes for longer inspection, Kimzey considers them from multiple viewpoints, translating them into complex, vibrant abstractions. In the painting Dog Eared (2018), for instance, Kimzey reflects on her nightly ritual of reading under a blanket, flashlight in hand, to keep from disturbing her sleeping partner. The ongoing repetition of this nightly activity activated an interest in Kimzey to portray this lived experience from not her own point of view, but that of the blanket itself. The bright glare of a flashlight and the constant folding and movement of the blanket throughout the night are recorded in this geometric composition, proposing that our daily interaction with otherwise insignificant objects can become a method of archiving our existence. Color always plays a significant role for the artist in these representations. The paintings often harken to the energetically intersecting planes of early 20th-century Futurist paintings, only updated with saturated hues of bright acrylic colors. Observing her surroundings, Kimzey maintains an awareness for the ability of color to dictate time. This is beautifully captured in Waking Up in a Tiny House (2018), depicting the experience of a bedroom’s color shift from deep blues to pale peach in the early hours of dawn. As in all of the paintings, colors begin from what is directly observed and eventually expanded upon in Kimzey’s signature style to create a more intense portrayal of the scene. Throughout the series there remains a tension between order and disorder, chaos and balance. Carefully executed structures are painted only to be broken apart and then built in a new way. Through this process, Kimzey is allowed to produce paintings that become heirlooms of the spaces and objects around her. These commemorative objects, however, do not set out to render these subjects in photographic detail, but rather seek to depict the elusive, immaterial experiences that they generate.